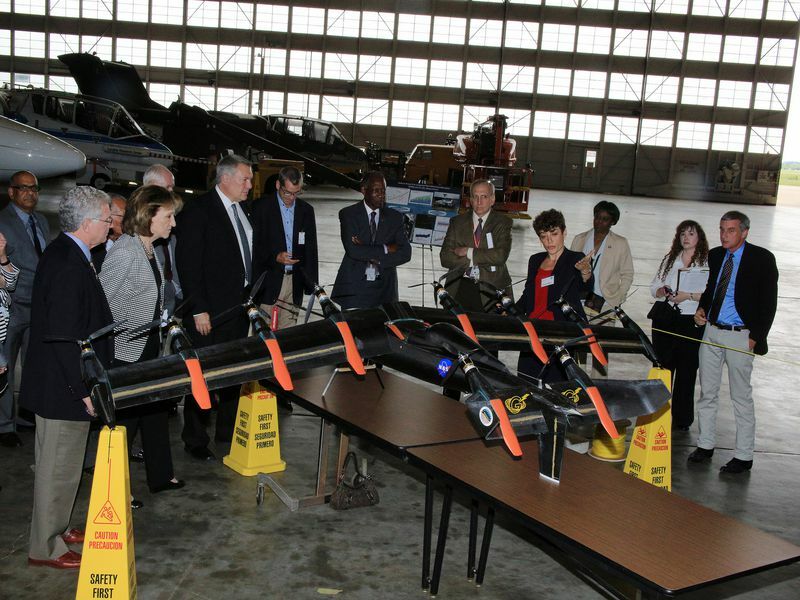 At NASA’s Langley Research Center, VIPs gather around a model of NASA’s latest experiment: an electrically-powered, distributed-thrust test bed. While most electric aircraft to date are close derivatives of their fossil-fueled predecessors, battery power makes practical things that don’t make much sense on conventional aircraft. One such advantage is distributed thrust. Conventional fuel is most efficiently used when taken from a single tank (or series of tanks) and sent to a single engine, which provides thrust. Batteries, in contrast, work almost as efficiently separated as they do grouped together, so why not spread them out and give each battery its own engine to power?